Nice pics Herr Leutnant , thank you - bis bald ! 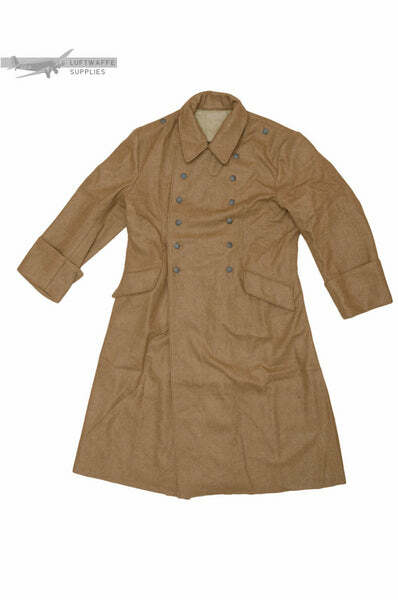 Got a very nice LW enlisted man's greatcoat from them, which I have upgraded with officer's shoulderboards. Very good fit and quality of material. Good price. Good service. They sell a relatively limited range of gear and specialise in tropical kit. They are based in Malta. I was feeling a little Christmassy and decided to have a photo-shoot featuring the improved Visor caps. I believe that a hand crafted visor cap really wraps up an impression nicely. I have a limited stock of flieger (yellow piping) and officer caps (silver piping) in White and blue-gray wool tops. Other piping are only available on order. Christian, is your rauchtarn 'blurred edge' smock a LWS exclusive? It looks really good; similar to older SM Wholesale pattern. Do you plan on making more patterns of camouflage smocks/covers/etc..? Thanks. I would not say it's an LWS exclusive, but having said that, I haven't seen this fabric among any other popular sellers. Helmet covers in the Blurred Edge fabric are in the pipeline. DOT-44 camo pieces are available and in stock as well. I have no concrete timelines on other camo right now, since I'm pushing for some new Luftwaffe items. Here's the 5-colour DOT 44 pattern as requested. Perhaps some of you would like to know, just a message to inform you that January Sale for 2014 is coming to an end this weekend. Just a small note to those who, like me, are not quite happy with the collar tabs currently available on the market. So it was back to the drawing board, examined a few original samples and tried out some fabric. 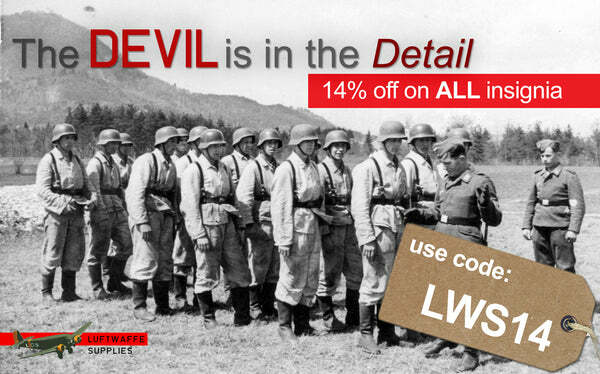 The LWS store has been updated with collar tabs using finer materials and in the original dimensions. Those of you who know me, know how much I love tropical uniforms. They're not the sharpest, but some of the most honourable men wore them. I was talking to like-minded re-enactors a few months ago and the concern about the lack of Tropical greatcoats came up. I finally would like to share with you the finalised version of this, currently only made per request, for €118.64 (excl Vat). Sizes guaranteed as usual. I got a pair of the new collar tabs - they compare very well indeed to my original collar tabs. Highly recommended! A heads up on some upcoming items that have been requested by the re-enactors that we work with. There is a void of uniforms that are not currently well reproduced or not at all. And that's were we come in. 2014 was a busy year of securing the original samples for these uniforms, from which the patterns can be studied and reproduced. I would like to take this opportunity to wish everyone on the Panzergrenadier forum a great and exciting 2015. I'm looking forward to see re-enactments on the anniversary of operations of 1940. Speaking of: LW drillich tunics in blue material - any chance of seeing them? I know Spearhead has/had them. Some background on their use and issue would also be great. Christian: lots of stuff on your site is sold out (i.e. tropical LW shoulder straps, FJ gasmask bags, etc.). Is there any chance of restock in the foreseen future?